Posted October 29th, 2012 by bbsadmin & filed under Education, General Business, Motivation. When people think of great inventors one of the first that comes to mind is Thomas Edison. One of his most notable inventions was his improvements on the incandescent light bridging the way to the light bulb we know today. What most people don’t know about Edison is his failures. His work on the light bulb was not an immediate success. It is said that it took 1,000 failures before its success. 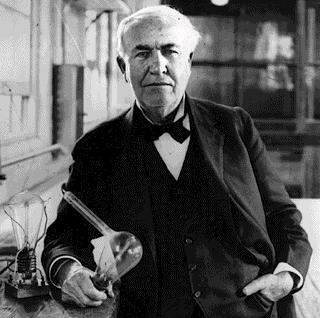 It is evident that Edison learned to not let failures turn him into a failure. Clearly he knew how to fail well. A business owner like Thomas Edison would not throw in the towel after 1,000 failures, they would learn from the 1,000 failures in order to make attempt number 1,001 a success. Shortly after a large fire consumed more than half of Edison’s experimental plan, he gave the word to his employees to report in to work as usual the next day. As the fire became controllable he said “there is only one thing to do… and that is to jump right back in and rebuild.” He also said, “Although I am over 67 years old I’ll start all over again tomorrow” (The New York Times). Edison knew how to not be distracted away from his goals by the trials that came his way. One of the first patents Edison made was an automatic vote tally machine which could make it easier to count votes than by hand. The successes that followed showed that he learned a principle of success; bate your hook with what fish will bite. Edison once said, “Anything that won’t sell, I don’t want to invent. Its sale is proof of utility, and utility is success.” Business owners and managers must find what people want and make it available rather than simply offering a product and hoping it is what people are looking for. Thomas Edison once said, “Discontent is the first necessity of progress.” Competition can sweep in and take market share as soon as one gets comfortable with things. If one is satisfied with what he has, there is no motive to put forth the effort for anything more. One must rise above the status quo. It is evident that Edison knew how to work hard; if by nothing else, by his many accomplishments. He created 1,092 patents. One of his quotes is “Opportunity is missed by most people because it is dressed in overalls and looks like work.” He also said, “Being busy does not always mean real work. The object of all work is production or accomplishment and to either of these ends there must be forethought, system, planning, intelligence, and honest purpose, as well as perspiration. Seeming to do is not doing.” A company can go under while its employees are working hard if it does not have the correct perspective. “The value of an idea lies in the using of it.